Blog. Astrological/spiritual current issues. Read through my latest blog posts and feel free to comment on them if you like. Anyone who meets this young lady in years to come will be enchanted by her compassion and sensitivity. Once again, Diana's shyness and desire to make the world a better place through voluntary acts of charity will shine through in this descendant. And that really is so obvious in this baby's natal chart. The incredible connection that Catherine, Diana and now the New Princess have is quite remarkable. Somehow the Cosmos managed to organise it that the position of the Sun at the moment of Diana's birth is the same position that the Moon was in when Catherine was born. And now the new baby was born as that same point in Cancer was rising over the Eastern horizon. Some coincidence that! And it tells a tale. This little Princess is not about the House of Windsor. The new arrival's birth chart has little in it to show that she has inherited personality traits from Prince Charles. They could honestly be unrelated, they are so distant. This is all about Diana and the Karma that lives on in her descendants. One amusing inherited trait is her aptitude for education. Diana once remarked how she struggled with academic stuff and it looks as if the new Princess will do too. She should be a late talker and possible slow to learn, but what she does learn she will remember, if that is any consolation. Unlike her brother George, it looks as if this Princess will spend a lot of her life in the Public arena and there she will feel comfortable despite her shyness and disinclination to speak. Like her brother she carries the energy of the Pluto Uranus square in an obvious way, so she too will have the urge to make a difference in the second half of her life. The challenges of Nature verses technology will be a big concern for this whole generation. But for now, let's just celebrate her gentleness and sensitivity and thank Diana for the beautiful legacy. I had my 15 minutes of fame this morning when I was quoted in an article in a national newspaper regarding the Solar Eclipse. However, the reporter had asked a lot more questions, so I'll put the rest of my answers in here, along with a jpeg of the article. How rare is this eclipse? A Solar Eclipse in itself isn't rare. We can get between 2 and 4 in a year. It is the fact that this is happening on the Equinox that makes it more special. That only happens very rarely. The last time that we saw such a thing was in the 17th century, 334 years ago, and there hasn't been one since. We will have 3 more in this century - all 19 years apart - and then there won't be another one until the 24th century. Well the rarity of it makes it important. But also the position of it in the sky is significant too. It is actually occurring smack on the East/West axis. Where ever you are in the world, the Sun will rise and set exactly in the East and West tomorrow and the eclipsed Sun is following that track. Along with North and South, this cross makes up the framework of the Zodiac Belt of Zodiac Signs. Tomorrow the Sun moves from the end of Pisces, the last Sign of the Zodiac, into the beginning of Aries, the first Sign, so this is a New Year in Astrology. This is always an important day every year, but tomorrow it is doubly so because of the eclipse. What does it mean astrologically? Usually the New Moon is about closing down the old stuff in our lives and starting new things. We get to clear out the things that have past their sell-by date, so new relationships and new projects can be investigated. However the eclipse throws all that into disarray. The Sun is a huge driving force in all our lives; it is not only `the light` it is a symbol of confidence and positivity. When the Sun is in good shape, we can see things clearly and look forward to the future. However tomorrow, the Sun's light is dimmed and this loss of strength and power will be synchronous with a general feeling of disquiet or strange `disturbance`. Personal strength could be drained and we might perhaps feel weakened in some way. So the thought of `new projects` may be tainted with a fear of failure, or loss of confidence. Is it a bringer of good luck or bad luck? Traditionally eclipses are associated with bad luck. They could portend the death of rulers or the defeat of nations. It was thought that a dragon was eating the Sun and this dragon was immortalised in mythology as the fire breathing dragon of Chinese art and eventually finished up as the dragon of `George and the Dragon` fame. To have the eclipse on the cusp of Aries like this would be seen as a bad omen for knights in shining armour or soldiers and war. What areas of life will it affect? Well one could interpret it for the world stage or for each of us personally. On the world stage it is about leadership and conflict. It may coincide with a stuttering or `blip` in strength. Or it could be time when wars are `disrupted` if such a thing is possible, or perhaps a war or conflict takes a different turn. Then in each of our lives it could be about personal strength. It may be symbolising a distinct lack of self-belief and lack of personal power. During the actual eclipse itself and for a short while, we may experience subterranean fears which invoke a `Dark Night of the Soul` feeling. Let's imagine an example from a movie? Say Superman bursts upon a crisis situation and the crowd shrieks in anticipation and delight… but then let's say he is knocked out by the Dark Villain. Now the crowd groans in fear and trepidation. Who will save them with the Hero gone? We get a sudden loss of confidence and a dark moment. But the trick to handling this eclipse is…. Keep Believing. Whether or not the Hero is unconscious, the Show will go on! And the more strength you give up, or the further down the slope you slide, the more you will have to catch up when Superman shakes his head and queasily stands again. Stay with whatever you are doing and hang on to your confidence. Don't let go, for normal service will be resumed and then you can pick up where you left off. Sometimes a fracturing of energy might occur, but you have to hang on and keep your position. This is so that you move forward from there. Don't lose ground! This is essentially personal re-birth energy and it is essentially rocket fuel. But it comes with `issues`. This is a shaky start to the astrological New Year, but it also a powerful one if you don't blink. Will it effect the economy? No I don't think so, unless leadership is involved. Should people be careful about making major decisions during an eclipse? I would leave anything that you can leave until next week. The energy in the atmosphere will be very disturbed and it will be best to let things settle before walking forward again. How long has this been foreseen? We can predict eclipses for many centuries ahead, so it has been known about for years. Does it signal a start of the ends of days, as some have said? No, I doubt it. I should imagine the world will go on as it always has. Friday 20th March is Important. It is the Equinox, but We Also Have the Rarest Solar Eclipse of the Last 334 Years. It is the day that the Sun's rays are directly over the Equator. The Sun is moving from being directly over one Hemisphere to being directly over another and this is the day it crosses the line or the most central part. This is best described by one of my poor hand drawings! At the Equinox, the tilt of the Earth is `side on` to the Sun and therefore the rays are falling directly over the Equator. Put that another way, at midday on the Equinox the Sun is directly over-head on the Equator. 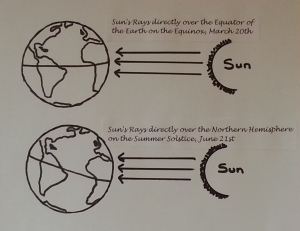 As you can see from the drawing, at the June Solstice, the rays are over head the Northern Hemisphere. If you live in the Northern Hemisphere, you won’t think this that big a deal because not much is happening in terms of the weather. We are still eagerly awaiting the Summer. But, the Earth knows what is happening all right, because the Sun's gravity is pulling as its navel. It takes 19 years for the Moon's orbit to re-coincide with the calendar set by the Sun, so it follows that an unusual event combining the two then takes another 19 years to happen again. This is one of the reasons that the huge stone circles or observatories of monolithic times had to be set up. So that observation and measurement would predict the next 19-year occasion. And so the coming unusual event of a New Moon happening on the day of the Equinox, which occurs this Friday, won't happen again for another 19 years and it last happened 19 years ago. BUT… there is more…. for the angle of the Sun, Moon and Earth can be slightly different during each of these times that there is a New Moon on the Equinox. If the Moon gets exactly in the way, it can result in an eclipse, but if it doesn't get exactly in the way, it won't – the exact alignment doesn't happen every 19 years. So actually, the Equinox that sees an eclipse is rare. These special eclipses comes in bundles of 4 or 5 and they occur one after another, every 19 years, for a century or so and then they disappear again for 334 years. So just to recap… there is a New Moon on the Equinox every 19 years for definite. But it only eclipses the Sun if we are in one of those centuries where there is a bundle of Equinoctial eclipses. And it so happens that such a bundle starts on Friday. Cool huh? The last time that we saw such a thing was in the 17th century, 334 years ago, and there hasn't been one since. We have 3 more in this century - all 19 years apart - and then nothing again until the 24th century. You can see where I'm going with this…. VERY RARE event about to happen! There is another interesting but weird mathematical fact about 2015 and 2387 – both years in which a new bundle of eclipse's on the Equinox begins. We have three Friday the 13th's this year. February 13th, March 13th and November 13th. And the next time that happens is at the start of the next bundle – 2387. I have no idea why! Okay we understand the rarity now, but what does it mean? Well the Earth is undergoing major stress, because the bulge of the Earth is actually a significant part. It is where the Earth is at its widest and where it is spinning fastest. If you stand at the North Pole, you aren't spinning at all, but if you stand at the Equator, you are travelling at a cool 1,000 miles per hour. (Well not `cool` perhaps, but you know what I mean!) Structurally the middle has importance. The `weather` starts there - as in winds - and Earth's geomagnetic field is `centred` around it. But I think the gravitational effects will be the most significant. The Moon is at its closest, so the combined gravity of the Sun and Moon will be great. The effect is likely to be disturbing. The huge tidal waves of air and sea that crash around our planet are disturbed and so too are the geomagnetic field lines and channels for ionised plasma. Expect your hair to stand on end! Unfortunately there has been a rather depressing turn of events since my article on Isis was written. And it really doesn't bode well for the future of the Middle East. 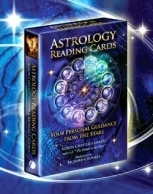 When a new nation or group is formed, then astrology recognises that this `birth` has a birth chart or horoscope, in the same way that a human has when they are born. Anything that `begins` has that beginning as its potential. It's kind of like a blue print for its life. And in this way, when ISIS (the Islamic State of Iraq and Syria) declared itself to be a new Caliphate called just IS - the Islamic State, the position of the planets at the moment of that `birth` became the horoscope for the new State. And what a depressing horoscope it is, for now it includes one of the most evil symbols in astrology…. a `planet` so malevolent, few astrologers will even use it in their work. And it is called Hades. On the day that the Islamic State was formed, the asteroid Isis and the `planet` Hades were exactly together in the sky. One on top of the other, so that their meanings become blurred. The meaning of Isis becomes synonymous with the meaning of Hades at that time. And even more ominous was their position in the sky, because they were both also forming a huge square around the Earth with Pluto, Uranus and Mars. I'll explain the meaning of all this by looking at the planets separately. Hades is a planetary enigma. It's projected position is far out from the Sun, billions of miles from Earth, in the frozen wastes near the edge of the Solar System. The Solar System itself is protected by a huge bubble of electromagnetic, solar energy called the Heliosphere, which keeps us safe from the ultra-high-energy radiation of interstellar Space. Basically, the stuff outside the Sun's bubble is so utterly lethal; it would destroy us in a nano-second. The Sun's heliosphere contracts and expands as the Sun `breathes`, so at times it is smaller and at other times it is bigger – think of a balloon being blown up or let down. This doesn't bother us because we are well inside the protective bubble, but there are a couple of known planets right out at the very edge of the heliosphere and Hades is one of them. These planets often find that the protective bubble has been withdrawn from them and then they are bombarded by the lethal, ultra-high cosmic radiation of interstellar space. This is a territory so dangerous and malefic to life, it truly reflects the horrors of Hell conjured up by medieval artists. But worse… for us it means the Gates of Hell have truly been unleashed. Okay, this has happened before in the terrible history of humankind and it could certainly happen again - for terrible evil is seemingly written into the DNA of the human race - but one hardly wants to consider it in the 21st century. We can do little but wait and see what happens next…..
Isis - Mythical Figure, Asteroid and Islamic Sunni Group. Isis and Her Homeland. During the week commencing 16th June 2014 a small lump of rock just 62 miles wide moved into position behind the Sun and the planet Mercury. Not an unusual occurrence, for the solar system is always in constant motion, with the planets/players in a beautifully choreographed musical performance. They sweep onto the stage, engage with the other players/planets and then move into the wings for a pause. The constant movement of these planetary `actors` taking part in this large production mirrors our own lives. And as they come together and reveal the unfolding plot, our lives also express this mysterious cosmic plan. And furthermore, the lores of astrology tell us that if another planet/asteroid gets next to the Sun like that, it means that this other planet/asteroid will be revealed. It's meaning gets highlighted in all our lives, as if a great light is shone on it. 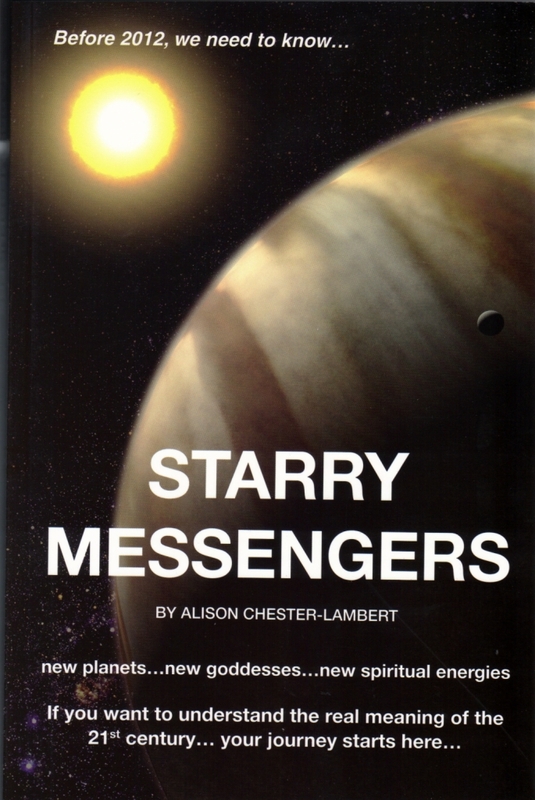 The planet Mercury is about communication, so we can add to the script that a revelation will be communicated to Earth. So even though the acronym ISIS isn't logically associated with Isis the asteroid, astrology tells us that there IS a connection between the two. And what else do we know about the energy and asteroid Isis? Well we have to turn to myth for that, and look within the Egyptian mythology around Isis, the Queen of the Underworld. She was best known for her magic and her courage in collecting together all the pieces of her dismembered husband after they had been scattered far and wide. She reassembled them, replacing his missing phallus with one she fashioned herself. Turning herself into a bird, she then hovered over her husband's remains and inseminated herself so that she could have their baby, which she raised alone. Isis was a protector, a nurturer, and an overseer of the cycle of death and re-birth. Her cult continued in Europe long after the power of Egypt had dwindled. So what does this tell us about the astrology of Isis? One particular element stands out and that is her tenacity and the magical ability to bring things back together and restore them. She is a Great Earth Mother and as such she has great power to return things to how they once were. We are now told that ISIS the Islamic group has just declared itself a new Islamic State, with its leader intent on drawing all the Sunni Muslims to him to form a new homeland. With Isis the Goddess appearing to back him up, he just may be able to do that. Isis also represents the sacred primordial Feminine that has been so successfully pushed to one side in the Masculine dash for technology and industrial growth. One of her issues may be about addressing this imbalance. From July 21st through to 2nd August, Isis the asteroid is working with Pluto and Uranus in an alignment round the Earth that looks like 3 points of a square. During this time we will find out just what her intentions are as she battles to assert herself against two other primordial energies intent on pulling things apart. Perhaps here on Earth, that may be acted out by two other nations or powers working to eliminate the new State of Islam. Watch this space…. For mythology tells us that if you cut off the head of the Hydra (another representative of Primordial Feminine) two more grow in its place….. and her cult continued in Europe long after the power of Egypt had dwindled. We should be careful here. On Friday 29th April, Prince William married Catherine Middleton and they became the Duke and Duchess of Cambridge. Catherine’s birth time is unknown, but it is perfectly retrievable by using the asteroid Juno. 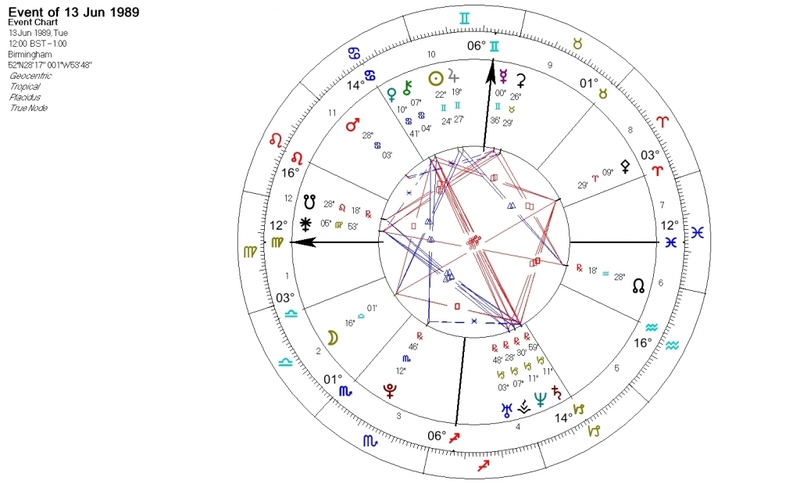 Since Juno is active in the charts of most brides, and the asteroid was making no close aspect to any of Catherine’s close personal planets, it was a simple matter to deduce that Juno must have been conjunct her Midheaven on that day. Her marraige in front of the world says it all really. This puts the time of birth of Catherine Middleton at 03.51am on the 9th January 1982 with a MC of 14 degrees of Virgo and an ASC of 22 degrees of Scorpio. 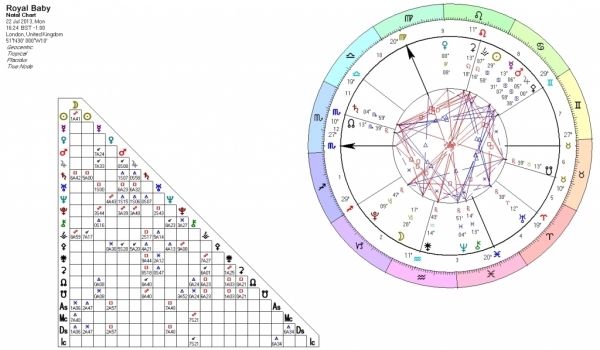 Strangely, when the Royal Baby was born on the 22nd of July 2013, it was at 16.24 in London, giving the baby a MC at 20 degrees Virgo and an ASC of 27 Scorpio. Since mothers and babies often share important chart points like this, it does add even more evidence to the rectified time of 03.51am for the chart of the Duchess. The IT infrastructure of the nation is now probably more important than our motorways. The boom of the last 20 years was almost entirely down to improved communications that facilitated more consumerism. OK, it allowed credit to cross national borders and become less person-centred and less responsible.... this is true, but it also allowed greater awareness of products and easier payments for things. Credit cards, Paypal and faster movement of money all helped people and companies to sell more. Slow/poor mobile IT performance is hampering our global competitiveness and cutting edge in the same way that shutting half our roads would. Germany, the USA and Sweden already have it and it is anticipated that 4G services will boost the UK's economy by around £2-3bn. Now some may argue that this is a step in the wrong direction and we should be de-technologising, not upping our game. BUT the biggest gain will be in video conferencing, meaning that many road trips don't have to be made. Industry will communicate faster with less obvious physical wear and tear on the planet. This puts us on a par with the early birds catching the worms. Clearly here we have a Uranus in Aries victory here, so what does Pluto in Capricorn think about it? I think Capricorn approves, this is infrastructure we are talking here and Pluto will help revolutionise that infrastructure. The Sun was coming into the Square from Libra at the time and anything that the Sun gets into is always bathed in positive energy. The Joy of Love or the Love of Joy? The Amazing Comet Lovejoy! On the 21st December 2011, the International Space Station commander announced that he had just seen the “most amazing thing he had ever seen in space”, which is one hell of a claim for such a veteran spaceman. From his position 240miles above the Earth he had just seen the long green tail of Comet Lovejoy which was the length of twenty moons laid side by side. A spectacular sight from space, but astronomers were being wowed with astonishment on the surface of the Earth too. But comets attract attention from more than just the boffins, since before history humankind has looked up to the sky and compared events there with events on Earth. Chief among these comparisons was the effect of eclipses and comets, for they appeared to coincide with specific events of great potency for nations or a Collective. 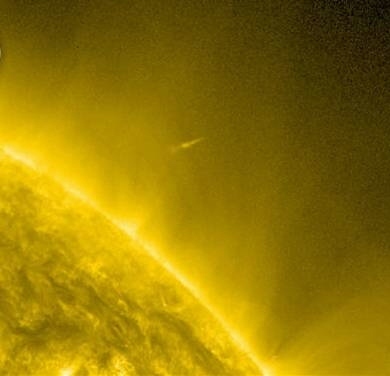 If the really bright ones are the most influential, it is important to look at the most surprising comet of 2011, for it was not only visible before sunrise during the Christmas period, it defied all predictions of annihilation as it plunged into the Sun’s atmosphere and survived……. Let’s start at the beginning…..
Comet Lovejoy was named after amateur astronomer Terry Lovejoy who discovered it on December 2nd 2011. It is thought that it is part of a group of comets called the Kreutz comets that swing very close to the Sun from time to time. They are part of the debris of the Great Comet of 1106 that broke apart in the 12th century(1) It is not uncommon for small comets (about 10 meters wide) to hit the Sun, and we have an observatory in space that records one every few days, but Comet Lovejoy was much bigger and estimated to be 100 meters across. On the 15th December, the astronomers were writing excitedly of the Comet’s brilliance as it started to get as bright as a really bright star in the sky. Because it was heading towards the Sun though, it was too near it to be spotted without specialist knowledge and equipment. At this point there was speculation that it might get bright enough to be seen by the naked eye, as Comet McNaught did back in 2007. Little did anyone know then that Comet Lovejoy was going to do far more that simply become visible….. it was also going to prove to be invincible…..
For instead of burning up as it skimmed 120,00kms above the surface of the Sun on December 16th, the comet amazed all the scientists by surviving. (2) As the astronomers watched, waiting for a cloud of vapour and comet dust followed by nothing, they stared open-mouthed as the comet emerged again from the surface of the Sun…still visible and clearly not destroyed. (See photo to the right - the Comet is the barely perceptible horizontal streak in the middle and about one third of the way down the photograph.) The plucky little comet had even more up its sleeve though, for as it zipped away from the Sun, its bright tail was wagging a full 90 degrees up and down. (3) This is unexplained and very mysterious. So to bring us up to date on 26th December….. we are now getting spectacular images of the comet’s enormous tail which is spanning the sky ahead of Sun rise everyday. It is heading out to the far reaches of the solar system again and there will be little to see soon, but until then it is proving to be breathtaking in the clearer night skies of the southern hemisphere. See photo at the top..
What does it mean? 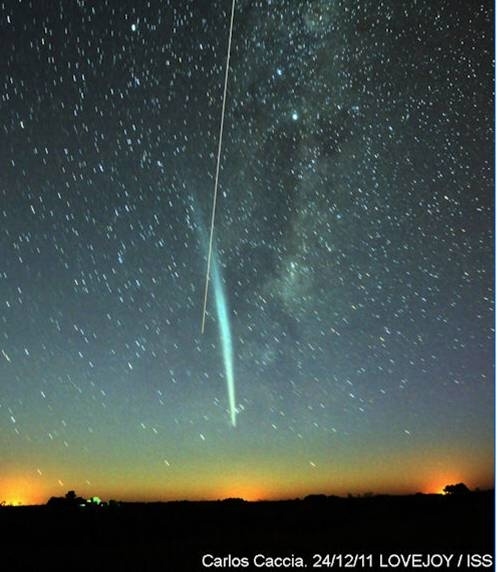 The last comet to produce such a show was Comet McNaught in January 2007. There is nothing to link that with the banking crisis of 2008, but generally we need to look at big time spans and national or planetary events like that. I think we can just toss it into the bag along with all the other Cosmic indicators of a tough few years ahead. No surprises there then….. but in the meantime we need to reflect on this comet’s resilience and surprising survival in the face of certain disintegration. How it wagged its tail like a wagging finger at the Sun as it raced away….nah nah na nah nah….. you can’t catch me…. and just hope that we should be so lucky….. And perhaps the name says it all after all! photos taken from the following links. 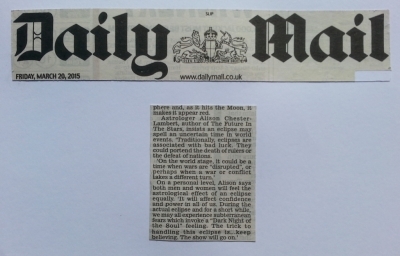 The big news on the 10th December 2011 was a total eclipse of the Moon. But elsewhere in the Solar System something else was happening too. A planet that had been appearing to travel backwards in the heavens for many months stood still, and the electromagnetic waves it pours forth were burning a path towards the Earth. The planet Uranus may be beautiful to look at but the meaning it imparts can be staggeringly impactful. For it represents revolution, rebellion and reform. This is the bringer of enlightenment and the symbolism of its apparent slow halt, followed by a stationary period and then a move forward is one of a lurching forward in the Collective. A pent-up stream of vast energy leaps into forward motion with the velocity of lightning slicing through space. A damn bursts ….a prisoner is released…. frissons of electromagnetic energy course through the existing field lines in our solar system, snapping and zapping into the Earth atmosphere to stimulate an already throbbing situation. 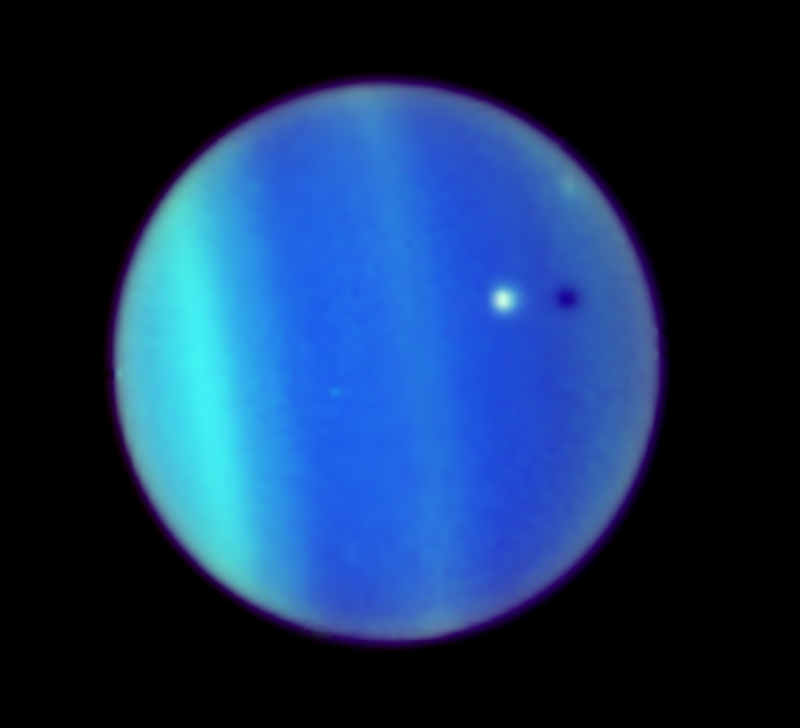 Uranus now races forward for a date with destiny. For the next significant aspect that this dynamic ball of energy will make is with Pluto – symbol of evolution – on the 21 June 2012. The Summer solstice. They will meet for the first time in a mammoth run of 7 clashes that will rock our world for the next four years. Heralding more change than we have witnessed so far in the 21st century. Corporate, financial, scientific and political paradigms will fall and rise as these two giants slug it out in the skies above our heads. Why Are the Looters Doing This? Around the 7th August 2011, England was rocked by mindless and extremely destructive and violent looters. They ransacked city centres throughout mainland England causing carnage, terror and millions of pounds worth of damage. Why? This is the generation who have been given everything? The rioters were all male youths in their early 20’s and this gives a strong clue to their motives, since it is easy to use astrology to go back to the late 80’s and ask what is it in their horoscopes that was so primed and ready to go off in this way. And the answer is easy to find. Uranus in Capricorn. So why? 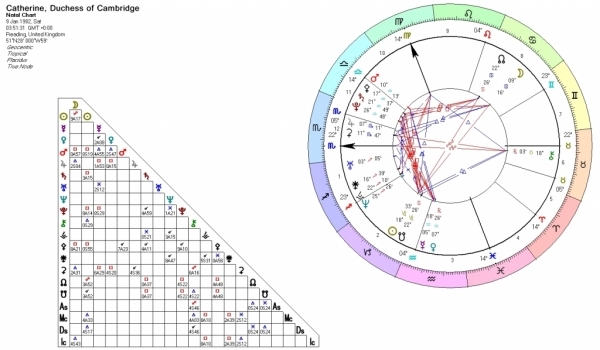 WHAT do they feel with their Uranus’s in Capricorn being transited by the T-square? Well, everything a Uranus in Capricorn person feels. The revolution is against the establishment of Capricorn. All the social structures that have been built for safety and security. They want to break free of restriction and boundaries. The lead weight of Capricorn feels too heavy and they resent it. Resent the achievement of others. Resent the old permanence. Resent the establishment. The natal Chiron in Cancer of the rioters tells us about how, deep down inside THEY feel they weren’t shown enough love by a generation of parents who put material achievements and presents over the more sensitive and loving demonstrations of affection. In short, we spoilt them with `must-haves` but missed out on Cancerian parenting and homelife. So now they have to break down the establishment to show their rebelliousness and disappointment. They were LOOTING quite specifically, removing and grabbing what they see as their rightful share of the bounty of the establishment. Not the cheap trainers, the Nike Airmax. Strangely, to rebel against the establishment, they must remove and own some of its products. It’s an` in-ya-face` thing against the provision of too much and the perception of not enough as a result. Maybe we gave them too much? Struggle is a necesary part of the human journey towards responsibility. Maybe, as with Uranus, now they just want to take without responsibility? I did say that this is how the rioters may be feeling. I didn’t say I sympathised! Chart of the late 1980's generation.